A different kind of cuisine was on display at the Festival and Symposium for the Expansion of Edible Insects this April 14th at the aT Center’s Grand Ballroom in Seoul. 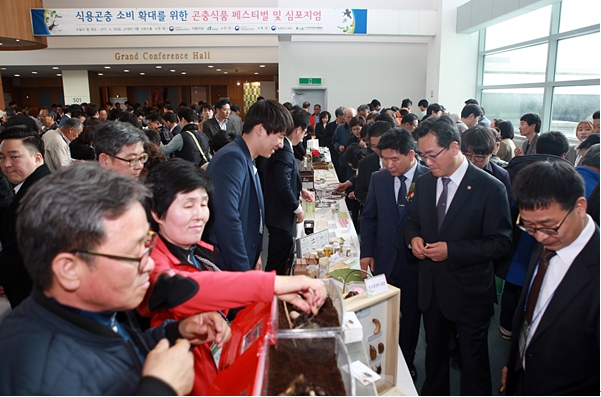 More than 1000 people from insect-based food companies, restaurants, academics, and local governments, came out to sample various insect delicacies. Approximately 30 companies exhibited at the show, which included an afternoon symposium attended by over 600 people. “I’ve heard that the posh mom’s in Gangnam are talking about slugs being great for test takers,” said Hwang-Guen Jeong, the head of Agriculture Promotion Agency. “It is true scientifically that insects have a lot of beneficial protein.” Other visitors had similarly positive things to say about insect-based foods. “Korea has the second largest number of patents for edible insects, second only to China,” said Dae-il Kang, publisher of the Food Journal. “Edible insects are helpful, not only for the nation’s health, but also for the farming industry if they become popular enough to use in the food and restaurant industry. The show gathered a lot of public interest with the afternoon symposium seeing so many people that there were no seats available and people were forced to stand.